Abu Zubaydah’s capture in 2002 marked the CIA’s first major al-Qaida capture after the Sept. 11, 2001, terror attacks, said John Kiriakou, a 15-year CIA officer who blew the whistle on the intelligence agency’s torture methods, earning him nearly two years of federal prison time. 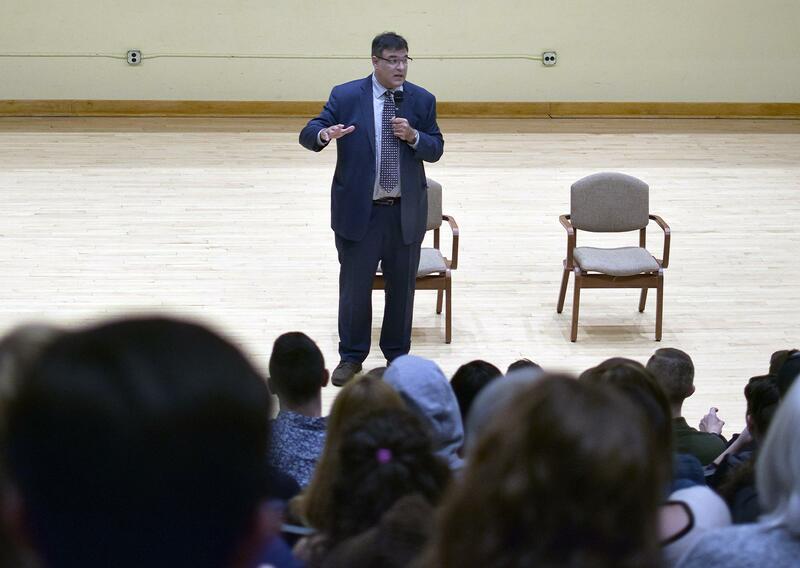 Kiriakou, a New Castle High School graduate and now a public speaker and anti-torture advocate, spoke to Slippery Rock University students and community members Wednesday evening about why he became a whistleblower in 2007. When Kiriakou asked for clarification about the techniques, the officer said, “We’re gonna start getting rough with these guys.” Kiriakou told the officer that he had a “moral and ethical problem” with torture programs and would not participate. “I was passed over for my promotion because of this,” he said. They told him he “demonstrated a shocking lack of commitment to counterterrorism,” Kiriakou said. The CIA asked 14 officers to participate in the “enhanced interrogation techniques” certification. Thirteen did. A CIA psychiatrist once told Kiriakou that the agency actively seeks to hire people with sociopathic tendencies. Kiriakou later learned that while in the CIA’s custody, Zubaydah had been tortured for years. The torturing included waterboarding, insects placed in a confined space and sleep deprivation. In fact, Zubaydah did drown, said Kiriakou. The CIA also went “off the books” in their torturing methods, said Kiriakou. Zubaydah still would not give the CIA information. He was waterboarded 83 times in a one month. Kiriakou retired from the CIA in 2004. He never told anyone about the torture until Brian Ross, a reporter from ABC News, accused him of torturing Zubaydah. Ross told Kiriakou he would have to come on ABC News and defend himself publicly. Shortly after Ross contacted him, Kiriakou was listening to one of President George W. Bush’s press conferences. Bush also said if there is any torture that goes on, it is only due to a rogue a CIA officer, said Kiriakou. The accusations from Ross became clear. “They are going to try to pin this one on me,” Kiriakou said. In 2007, Kiriakou decided to talk on ABC News and tell the nation the truth. “I believe the American people (had) a right to know this information. We have a constitutional right to know what our government does,” he said.